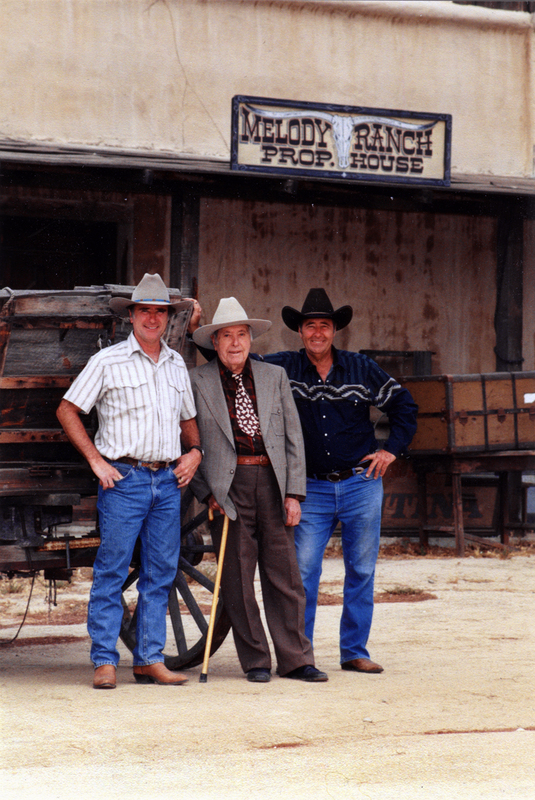 The three owners of the Melody Ranch Motion Picture Studio in Placerita Canyon: Paul T. Velzuat, center; sons Renaud (left) and Andre (right), in front of the prop house in 1997. Following the devastating 1962 fire that burned down most of the buildings at Melody Ranch, Gene Autry and his wife, Jackie, began selling off pieces of the 110-acre property in Placerita Canyon. The last 10 acres, where the buildings had stood, went on the market in November 1990. Patriarch Paul T. Veluzat and sons Renaud and Andre Veluzat, who owned other Santa Clarita Valley movie properties including a large movie ranch in Haskell Canyon and a motion picture vehicle rental business, bought the property and began rebuilding Melody Ranch to its former glory. Today the ranch is once again alive with feature, television, commercial and video filming. For 20 years, from 1994-2014, it was the main venue for the city of Santa Clarita's annual Cowboy Poetry and Music Festival (aka Cowboy Festival). Paul T. Veluzat hailed from Kentucky and came to Newhall around 1939. He took vitamins every day of his adult life and lived to age 101. LW2062b: 9600 dpi jpeg from original print, photo by James Fors ©1997 Old Town Newhall Gazette (SCVTV).